This post is sponsored by Vitamix. All opinions expressed are my own. Explore the savory side of Pumpkin with this Mediterranean Roasted Pumpkin Salad – zesty, spicy and comforting, with lots of added fruit and nuts, this makes for the perfect side for your Thanksgiving feast or any other festive dinner. It can also easily be made vegan! It’s pumpkin season again!! 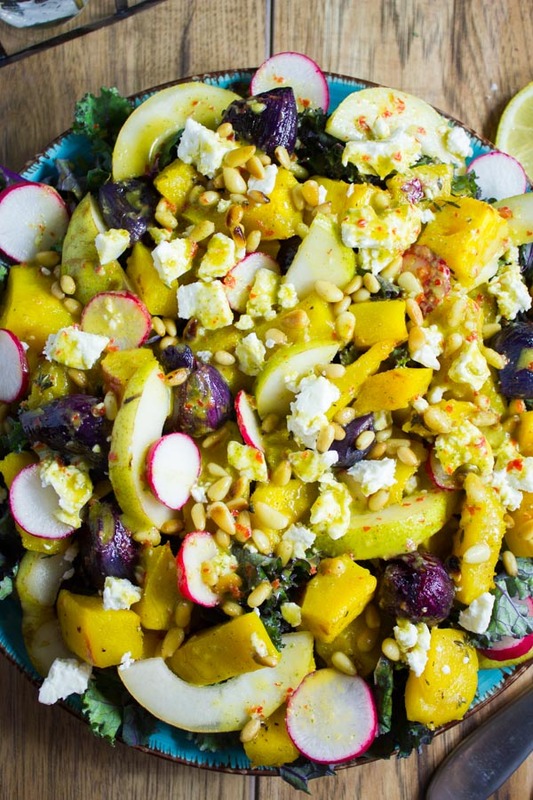 And this Roasted Pumpkin Salad recipe is a great way to try the savory side of pumpkin. This Thanksgiving, pause the cinnamon and spice, forget pumpkin desserts, and go for a zesty, spicy and comforting roast pumpkin salad. Serve it with any hearty main dish you’re making—it’ll add the perfect comfort and fall feel! My dearest reader, there’s something so exciting today. Actually there are a few amazing exciting things today—I’ve managed to pull together my very first VIDEO!! Oh, that was quite an experience! Check out the video below and be nice -it’s my first! It shows you how simple, easy and different this Mediterranean Roasted Pumpkin Salad is. Let’s talk a minute about this Mediterranean Roasted Pumpkin Salad. Don’t you just love pumpkin season? I’m one of those who could have pumpkin all year long. Aside from sweets and pumpkin spice (which I absolutely love too), pumpkin has such a nice nutty, sweet taste and paired with the creamy smooth texture when cooked? What’s not to love? While we all love our pumpkin desserts, it’s also a great candidate for savory dishes—did you miss this Kale Mushroom Pumpkin Alfredo Pasta recipe I made last year? Now, for today’s healthy fall salad, I’m roasting the pumpkin. Those cubes of roasted pumpkin and pearl onions with just a touch of seasoning add plenty of texture and a hearty feel to the salad. This savory feel is pure comfort, especially for the Holidays! I chose a really special dressing for this Mediterranean salad, which is different than the usual Thanksgiving and Holiday flavors. The dressing for this salad is zesty, spicy, sweet and garlicky. It pairs wonderfully with the roast pumpkin. It compliments the sweetness and ups the flavor tremendously. As main ingredients, I chose kale, ripe pears for lovely sweetness and tender texture, radishes for some crunch to compliment the tender soft roasted pumpkin and onions, crumbled feta and toasted pine nuts. Preheat the oven to 400 degrees F. On a parchment lined baking sheet, arrange the pumpkin cubes with the pearl onions and season them with the remaining ingredients. Roast for 20 minutes or until tender. 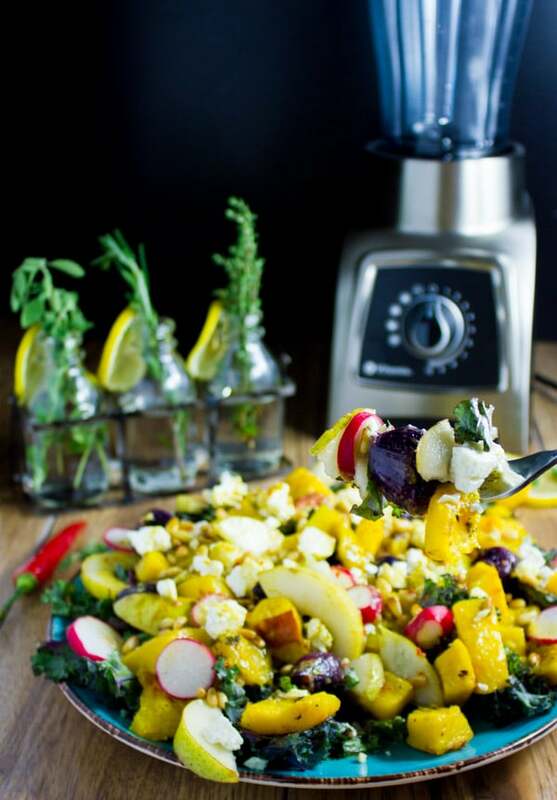 In the meantime, make the dressing by adding the ingredients to a blender and pulsing them for a few seconds until smooth. Assemble the salad by layering the kale, roast pumpkins, onions and remaining ingredients, then drizzle the salad dressing evenly over the salad. Enjoy! If you don’t like kale, feel free to use arugula, spinach or salad greens. You can prepare the dressing and salad separately up to 3 days in advance and add the dressing only the day you’re serving this Mediterranean Roasted Pumpkin Salad. If you’ve got any leftovers, they make a perfect office lunch for the next day. Skip the feta cheese and use maple syrup instead of honey to make this salad vegan-friendly! Explore the savory side of Pumpkin with this Mediterranean Roasted Pumpkin Salad - zesty, spicy and comforting, with lots of added fruit and nuts, this makes for the perfect side for your Thanksgiving feast or any other festive dinner. It can also easily be made vegan! Preheat the oven to 400 degrees F. On a parchment lined baking sheet, add the pumpkin cubes, pearl onions and season them with the remaining ingredients. Roast for 20 minutes until tender. In the meantime, make the dressing. Add the dressing ingredients in a Vitamix blender and blend for a few seconds until smooth. If you don't like kale, feel free to use arugula, spinach or salad greens. This is a salad that could become a family tradition. Thanks, Mahy! Sharing. I never really got into pumpkin in savoury dishes until my twenties and now I can’t get enough! Makes me sad the season for fresh pumpkin is so short! 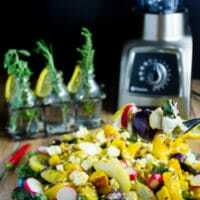 This salad looks absolutely delicious Mahy!